Barndancing is a great way to bring everyone in the community together. It is great fun and also a good fundraiser. It need not only be for children or people of the same age group, but it works brilliantly for people of ALL AGES to interact. It is a FLEXIBLE form of entertainment that can be a smart, sassy, corporate event, or a more relaxed homey interaction with people you know and love. Or anything in between. We will run the evening in a way that works for YOU. What could be better - it is so simple to do and such fun! The whole family can come along and dance together. We do many 21st's, 30th, 40th, 50th, 60th and even 70th parties! Sometimes we can come and do a smaller function with a smaller sound system - eg for a girl's 10th birthday with 25 children on a Saturday afternoon. We do many end of year ( mostly Grade 7) functions for co-ed schools such as Grove Primary, Kirstenhof Primary, Muizenberg Jnr, Fish Hoek and Panorama Prep. These have become an annual institution, as has the Westerford Matric Social. Some boys and girls schools do socials ( eg Western Province and Herschel) as a fun way of interacting. What about a Fathers and Daughters dance? Or an end of year Staff party with a difference, and the partners can come as well? 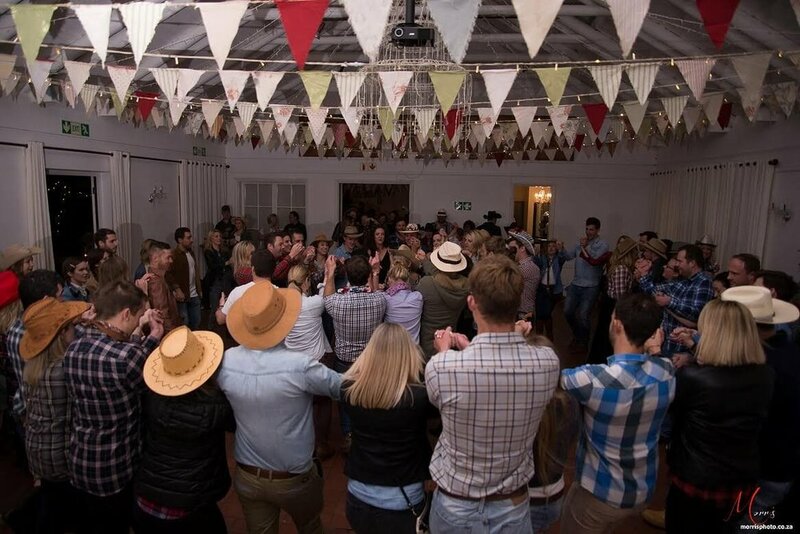 Barndancing is a great form of entertainment for Western Theme functions. Everyone loves getting dressed up in their jeans and cowboy boots, and the line dancing goes down a treat. Hire a mechanical bull for added entertainment. Yeee haaah! We often work in conjunction with a DJ, who can take over when the crowd want to boogie on 'till late. We have often worked in venues like Ratanga Junction, Spier Wine Estate, Fancourt and Civic Centres.